MessageExport is an add-in for Microsoft Outlook that expands Outlook's ability to export email messages to different formats. A useful feature is the ability to export multiple emails and file attachments into a single PDF file. 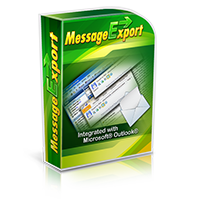 MessageExport integrates tightly with the Outlook toolbar. Export operations are done by way of "export profiles" which can be customized to fit specific purposes. MessageExport ships with many standard export profiles, including three variations that will allow you to export email to a single pdf file. To select these profiles, click on the drop down list. MessageExport supports three different processes for converting Outlook mail to a single PDF. You can convert the email and attempt to convert document file attachments into the PDF image; you can convert the email and embed file attachment as distinct files within the PDF file; or you can convert the email and save the file attachments to a location on your hard drive. In our example below, we have selected the profile called "Single PDF - attachments converted/included." Next, choose the email messages you want to convert to a single PDF file. Although there is no limit, we recommend no more than 500 emails in a single pdf file. They can become very large very quickly. After the emails are selected, click MessageExport's blue Export button to begin the conversion process. MessageExport will continue until the operation has completed, and all selected emails have been processed into a single pdf file. For more information about MessageExport, or to download a 15 day free trial visit the MessageExport home page. If you decide not to purchase MessageExport after the trial is finished, leave it installed! It will still allow you to convert single email messages to PDF and other formats, free. You can purchase MessageExport at a later time if you decide you want to enable to bulk export functions.